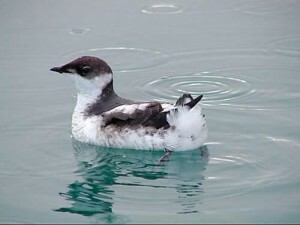 OLYMPIA, Wash. – A recently released independent scientific peer review confirms a proposed wind power project near Naselle, Wash., will not have a significant impact on the marbled murrelet. Development of the Radar Ridge Wind Project is being considered by four western Washington public utility districts: Clallam County PUD No. 1, Grays Harbor PUD No. 1, Pacific County PUD No. 2, and Mason County PUD No. 3, in conjunction with Energy Northwest, a consortium of 27 Washington State public power providers. The public utility districts commissioned an independent peer review, released in mid December, of a scientific model at the recommendation of U.S. Fish and Wildlife Service (FWS), Washington Department of Natural Resources (DNR), and Washington Department of Fish and Wildlife (DFW). Developed by Western Ecosystems Technology, Inc., the model simulated the risk of harm to marbled murrelets due to the proposed wind project. The model concludes that project construction and operation will not have a significant impact on this coastal seabird listed as threatened under the Endangered Species Act. Dr. Raoul LePage, a noted Professor of Statistics at Michigan State University, critically examined this risk model, concluded it is mathematically valid and would not result in incorrect conclusions. Dr. LePage also reported that because so few murrelets have been observed flying over the project area, the results produced by the scientific model are as close to providing an answer about the potential effects of the wind project on these birds as would ever be possible to obtain. Dr. LePage has with more than 30 years of related experience. The model reviewed by Dr. LePage utilized data from three years of on-site breeding season studies conducted by Hamer Environmental, an environmental consulting firm nationally-recognized for its marbled murrelet expertise. Hamer's findings indicate the proposed project site has very low passage rates over the ridge top for all bird and bat species, including birds of prey, migratory birds and the marbled murrelet. These wildlife studies were conducted in consultation with state and federal wildlife agencies, and meet or exceed published agency guidelines. Dr. LePage's evaluation of the risk model is the second independent peer review of data collection and studies associated with the proposed project. An initial peer review of data collection and modeling assumptions was completed by Brian Cooper of ABR Inc. These independent scientific peer reviews confirm findings that as a result of construction and operation of the Radar Ridge project the number of marbled murrelets affected will not be significant. "It is important that decisions regarding this project are based upon an objective review of the best available scientific information. This recently-completed independent scientific review provides further assurance that we are making decisions based on the most in-depth, accurate and complete data," said Matt Samuelson, Radar Ridge participant's committee chair. "These peer reviews address the misperceptions about the project created by a DNR Report issued in July, 2009," Samuelson added. Samuelson stated that the report released earlier this year was based on incomplete study data. "It contained analytical errors, and did not attempt to analyze the actual risk of marbled murrelets being harmed by wind turbines," he said. Results contained in the report have been cited by DNR and representatives of FWS as potential reasons for concern about the proposed wind energy project. The scientific studies, modeling results, and the outcome of this peer review will be included in permitting documents now being prepared. The public utilities continue to work in cooperation with the landowner (DNR), and state and federal wildlife agencies, and remain fully committed to ensuring the project is developed in a manner that is protective of the environment. The not-for-profit utilities are pursuing the project to help meet renewable energy mandates imposed by the 2006 Washington Energy Independence Act on the state's larger electric utilities. They estimate the project may begin operations as early as late fall 2012. Radar Ridge is slated to be the first large-scale wind project in western Washington. The project is being considered by four western Washington not-for-profit public utility districts: Clallam County PUD No. 1, Grays Harbor PUD No. 1, Pacific County PUD No. 2, and Mason County PUD No. 3, in conjunction with the project developer, Energy Northwest, a consortium of 27 Washington State public power providers. The site has existing nearby electricity transmission lines with adequate available capacity to support the project. The location will also ease some aspects of electricity transmission congestion caused by increased renewable energy flowing from eastern Washington wind resources to the western side of the state. The project, proposed on DNR land, could generate up to 82 megawatts of electricity; enough energy to power approximately 18,000 homes. It is expected to consist of up to 32 wind turbines on towers no taller than approximately 262 feet. As state Trust land, revenue from the project will help pay for construction of public schools, universities, and other state institutions, and fund county services. The project is also favored for its "winter peaking" potential because it is expected to produce the majority of its power in the winter months when the participating utilities need it most.